The Cape Canaveral Lighthouse in 2009, after intensive restoration. 1st order: flashing white every minute - flash 5 secs, eclipse 55 secs. Current: Fl (2) W 20s. The Cape Canaveral Light is a historic lighthouse on the east coast of the U.S. state of Florida. The light was established in 1848 to warn ships of the dangerous shoals that lie off its coast. It is located inside the Cape Canaveral Air Force Station and managed by the 45th Space Wing of the U.S. Air Force with the assistance of the Cape Canaveral Lighthouse Foundation. It is the only fully operational lighthouse that is owned by the United States Air Force. The current 151-foot (46 m) lighthouse tower was first erected and lit in 1868 then relocated further inland between 1893-1894. It was originally equipped with a first-order Fresnel lens that was automated in 1967 and then retired from the tower in 1993. The Cape Canaveral lighthouse was erected to warn mariners of the outlying shoals off its coast. Broken ground and shoals extend 13 nautical miles (24 km; 15 mi) northward and northeastward of the lighthouse terminating in the Hetzel and Ohio shoals, which have a depth of 11 ft (3.4 m) and 19 ft (5.8 m) respectively. Hetzel Shoal is located about 13.5 nautical miles (25.0 km; 15.5 mi) NE of the lighthouse and Ohio Shoals about 2.3 nautical miles (4.3 km; 2.6 mi) southward of Hetzel. In a heavy sea these shoals are marked by breakers, but with smooth sea there is nothing to indicate their locality. The land is usually not visible from off these outer shoals. Located closer to the land are the Chester, Bull and Southeast shoals, which are about 4.5 to 7.5 nautical miles (8.3 to 13.9 km; 5.2 to 8.6 mi) off the coast of the cape. The current Cape Canaveral Light is not the first lighthouse constructed on Cape Canaveral. On May 21, 1838, the building of the first lighthouse at the cape was requested by Florida territorial delegate Charles Downing. Nathaniel Scobie was appointed as the first lighthouse keeper and oversaw the construction of the lighthouse. The 65-foot (20 m) tall white conical brick tower and keeper's dwelling were completed in January 1848 at the cost of $13,300. Its light consisted of 15 Lewis lamps powered by whale oil, each with a 21-inch (530 mm) reflector. The lamps were set on a chandelier rotated via clockwork. During the Seminole War scare, Scobie abandoned the lighthouse, and refused to return to his post. Captain Mills Olcott Burnham (b. September 8, 1817) was appointed as the next lighthouse keeper in July 1853. 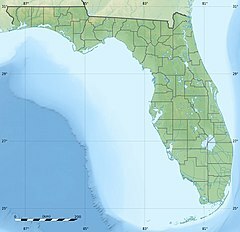 Along with his position, Burnham was given 160 acres (65 ha) of land as part of the Florida Armed Occupation Act of 1842, a legislation passed to populate the state. Sailors heavily criticized the white brick lighthouse with complaints that the light was too weak and too low to be seen before ships were on the reefs near the cape. In 1860, the government approved the construction of a new lighthouse. However, the start of the American Civil War stopped the work on the new tower. The lamps and mechanism of the lighthouse were removed from the tower by Burnham and buried in his orange grove to protect them from Federal raids. At the end of the war, construction resumed on the lighthouse. The chosen replacement tower was made with cast iron plate designed so that it can be disassembled and moved to a new location at a minimal cost, in case the encroaching sea started threatening the lighthouse. The conical tower was lined inside by bricks for stability and insulation. It was situated about 80 to 90 feet (24 to 27 m) from the location of the first tower. The new all-white lighthouse tower was completed in 1868, receiving a first-order Fresnel lens made by Henry-Lepaute and Company of Paris, France that was first lit on May 10, 1868. The lower three levels of the tower served as the living quarters for the keepers and his assistants complete with kitchen, living room and bedrooms. The tower was designed to withstand flooding from storm surges that accompany strong hurricanes by making the entrance to the tower on the third floor, accessible by an outdoor stairway (the ground level door was later added in the 1930s). This was tested in 1871 when a strong storm submerged the station. The lighthouse and its keepers survived but the lamp oil and their drinking water were spoiled by the flood. The white lighthouse tower was changed to its signature three black bands and three white bands in 1873, with the lantern room remaining white. Soon after, the iron tower became unbearable to the keepers under the Florida sun and humidity. They built and stayed in makeshift dwellings on the grounds of the lighthouse rather than stay in the oven-like tower. In 1876, funds in the amount of $12,000 were appropriated to construct permanent dwellings for the keepers. By the 1880s, shoreline erosion was feared to be threatening the lighthouse, and the United States Congress appropriated funds to move the lighthouse inland. Initial work to move the tower was started in October 1893. A temporary 55-foot (17 m) square black skeletal pyramidal lighthouse was erected to keep that section of the sea lit during the move. The tower had a 4th-order lamp with a focal height of 57 feet (17 m) and a visibility of 13 nautical miles (24 km; 15 mi). The old tower (1848), which stood next to the new tower for about two decades, was blown up and the rubble was used to prepare a foundation for the lighthouse at the new location. The cast iron tower was dismantled, moved by a tram pulled by mules, and reassembled at the new location about a mile westward together with the keepers' houses. The move took nine months, and the lighthouse was relit at its new location on July 25, 1894. The 1900 Atlantic List of Lights indicated the color of the lantern room, which was probably painted during the move, as black. William H. Peck wrote about his meeting with lighthouse keeper Mills Burnham of Cape Canaveral in the Florida Star newspaper in 1887. In 1931, the mechanical clockwork of the tower that was turned by descending weights and needed winding every hour or two was modernized and replaced by an electric motor. President Harry S. Truman signed the legislation titled Public Law 60 on May 11, 1949 that established Cape Canaveral as the Joint Long Range Proving Ground, a site for missile testing by the military. By this time, several small communities had developed in Cape Canaveral, two of which lies near the lighthouse: De Soto Beach to its north, which was located in the vicinity of Launch Complex 36 and Stinkmore to the south, located near Launch Complexes 17 and 5. When rockets began launching from the Cape in the early 1950s, all its residents, except the lighthouse keepers, were relocated to other areas. In 1960, the need for a keeper to live nearby was eliminated with the automation of the light. The keeper's homes were later demolished leaving only the brick oil house in the vicinity of the lighthouse. After it was discovered that strong vibrations that accompany launches were loosening the prisms of the first-order Fresnel lens, it was finally removed in 1993 and sent to the lighthouse museum of the Ponce de Leon Inlet Light for restoration and display. The light was replaced by a DCB-224, a high-power searchlight that increased its range to 24 nautical miles (44 km; 28 mi). The 16.5-foot (5.0 m) tall original 1st-order Fresnel lens of the Cape Canaveral lighthouse (left) on display at the Ponce de Leon Inlet Lighthouse Museum with the 1st-order Fresnel lens of the Ponce de Leon Inlet Light (right). Ownership of the lighthouse was transferred by the Coast Guard to the United States Air Force on December 14, 2000. In 2002, the Cape Canaveral Lighthouse Foundation was formed and a memorandum of agreement was signed with the USAF. The Cape Canaveral Lighthouse in 1995 before restoration. Since toxic lead paint was used to paint the lighthouse, a restoration project from 1995-1996 sandblasted the harmful paint off. The original copper lantern was also replaced with a galvanized steel lantern and was made into a lighthouse gazebo at the grounds of the Air Force Space & Missile Museum at Launch Complex 26 inside the Cape Canaveral Air Force Station. A plaque mounted on a podium made from bricks of the 1848 lighthouse, was built to commemorate its dedication in October 1997. In 2003, the oil house located in front of the ground floor door was restored to its original (1890s) state. Strong winds had damaged the roof in the 1970s. A window that was added to the brick structure in the early 1900s was also covered up during restoration. During the 2006-2007 project, the structure was repainted using modern materials. The original copper lantern was repaired and restored to the lighthouse. The displaced galvanized steel lantern took its place at the lighthouse gazebo leaving just the original copper vent ball on its top. Ground sample tests taken in 2008 showed a very high level of lead in the soil around the tower, and visitors were kept 50 yards (46 m) away from the lighthouse for some time. The lighthouse is open to public visitors and previously was a part of the Air Force Space & Missile Museum public tour. However, as of 2013 due to sequestration the 45th Space Wing no longer offers a tour of the area. Currently, those seeking to visit the lighthouse, and nearby museum should book touring by the Cape Canaveral Lighthouse Foundation. It should be noted that visitors may only ascend to the fifth floor of the lighthouse as the remaining floors have been deemed as a safety liability by the Air Force and require special access to ascend. The Cape Canaveral Lighthouse Foundation and volunteers are instrumental in the restoration projects and in interpreting the lighthouse history. Future plans of the foundation includes the restoration of the three keeper's cottages for multipurpose use. ^ a b c d e f g "Cape Canaveral, FL". Lighthouse Friends. Retrieved on 2012-11-08. ^ a b c "A Living Light". Welcome to the Cape Canaveral Lighthouse. Cape Canaveral Lighthouse Foundation. Archived from the original on 3 February 2014. Retrieved 25 August 2014. ^ a b c d e (2003-01-03). "Inventory of Historic Light Stations, Florida Lighthouses - Cape Canaveral Light". National Park Service. Retrieved on 2012-11-13. ^ a b c Light List, Volume III, Atlantic Coast, Little River, South Carolina to Econfina River, Florida (PDF). Light List. United States Coast Guard. 2012. p. 5 (39). ^ a b c Office of the Lighthouse Board (1900). "List of Lights and Fog Signals on the Atlantic Coast of the United States, 1900", pp. 160-161. Government Printing Office, Washington. ^ a b United States Coast and Geodetic Survey (1922). "U.S. Coast Pilot: Atlantic Coast Section D", pg. 122. Government Printing Office, Washington. ^ (2012). "Pub. 110, List of Lights", pg. 121 (152). National Geospatial-Intelligence Agency. Retrieved on 2012-11-08. ^ "Cape Canaveral Light". Amateur Radio Lighthouse Society. Retrieved on 2012-11-08. ^ United States Coast and Geodetic Survey (1900). "United States coast pilot: Atlantic coast. Part VII. From Chesapeake Bay entrance to Key West, Part 7", pg. 40. Government Printing Office, Washington. ^ a b c "Img_0338 (Cape Canaveral Lighthouse Florida heritage marker)" Archived 2013-06-18 at the Wayback Machine. Cape Canaveral Lighthouse Foundation. Retrieved on 2012-11-08. ^ "P1010026 (Photo Gallery - Brevard Museum Collection)". Cape Canaveral Lighthouse Foundation. Retrieved on 2012-11-13. ^ Office of the Lighthouse Board (1894). "List of Lights and Fog Signals of the Atlantic and Gulf Coast of the United States". Government Printing Office, Washington. ^ Lethbridge, Cliff. "The History of Cape Canaveral Chapter 2". Spaceline.org. Retrieved on 2012-11-12. ^ Lethbridge, Cliff. "The History of Cape Canaveral Chapter 1". Spaceline.org. Retrieved on 2012-11-12. ^ "Historic Light Station Information & Photography - Florida". United States Coast Guard. Retrieved on 2012-11-13. ^ a b (2012). "Lighthouse Gazebo". Air Force Space & Missile Museum. Retrieved on 2012-11-10. ^ "Oil House Restoration" Archived 2012-08-26 at the Wayback Machine. Cape Canaveral Lighthouse Foundation. Retrieved on 2012-11-13. ^ "Lighthouse Tours". Cape Canaveral Lighthouse Foundation. Retrieved on 2017-1-20. ^ "Plans & Status" Archived 2012-08-08 at the Wayback Machine. Cape Canaveral Lighthouse Foundation. Retrieved on 2012-11-10. Wikimedia Commons has media related to Cape Canaveral Light. This page was last edited on 16 August 2018, at 15:01 (UTC).